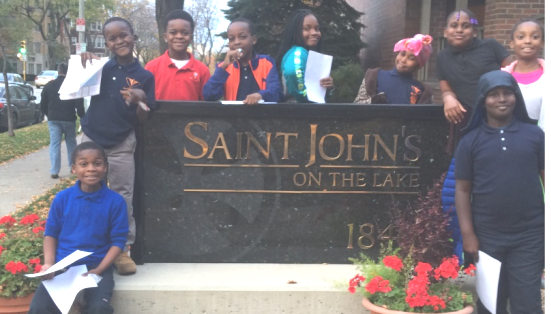 Our Next Generation (ONG), an after-school (and summer) program headquartered at North 35th Street and West Lisbon Avenue, has a special relationship with Saint_John's On The Lake. It’s a two-way, crosstown relationship. On Tuesdays during the school year, the Saint_John's bus carries dedicated resident volunteers to participate in ONG’s Homework Club, which is located in what ONG president and CEO LaToya Sykes describes as “the heart of one of Milwaukee’s most challenged neighborhoods.” On Mondays, third-graders from ONG ride over to Saint_John's to participate in activities designed to boost the students’ interest in reading, and learning in general. Jonte, a bright-eyed first grader, describes ONG as “the best place in the whole wide world!” Begun in 1992 with about twelve students and twelve tutors, ONG now serves hundreds of children from 25 different schools, first grade through high school. The late Charlie Drake, then a member of Christ Church in Whitefish Bay, was among the founders of ONG and remained a regular supporter and active volunteer after he moved to Saint_John's 12 years ago. The ONG site is the former location of Saint Andrew’s Episcopal Church, a parish established in Milwaukee in 1898. The church housed the program when it started and ultimately gifted the site to ONG some years later. Charlie first got involved with the neighborhood around 35th and Lisbon in 1990 when he read in the newspaper about difficulties facing children in the community such as poor educational outcomes, lack of jobs, gang activities, even shootings. He started attending church at Saint Andrew’s and became engaged with people in the community. Together they established a tutoring program at Saint Andrew’s. A number of the original tutors were recruited from Christ Church in Whitefish Bay and Charlie happily reported that most of the early ONG children, now adults, are working at steady jobs. Saint_John's volunteers head off to the ONG Homework Club Center on the Saint_John's bus and these volunteers primarily help students with their homework, but also read with them and play games. Volunteers are matched one-on-one with individual children, ideally the same child each week. Saint_John's resident Ann MacIver has been blessed to have the same child for three years. As an Outbound Site for ONG, Saint_John's hosts children on Mondays for interaction with residents and employees. Over the ten years this program has been in existence, 38 Saint_John's residents and employees have been involved. The Monday program focuses on activities involving reading, art, science, music, and math, and is designed to boost students’ interest in reading and learning. Rukiya Alexander, Associate Director of Programming at ONG, reports that the children love coming to Saint_John's . Rukiya told us recently of a young boy who was shocked to realize that the group would not be coming to Saint_John's anymore after the final day of that school year, saying, “But what will they do without us?” What indeed! Both the Monday and Tuesday programs bring us into relationship with children of Milwaukee, enriching our lives even more than it does theirs. For more information about ONG, go to their website, ongkids.org.